If there's one thing you could always safely have said about a Breitling Navitimer it's that you damned well knew what it was, even from one hundred paces. Well, not anymore! Because the brand beloved by generations of aviators has taken its most iconic model and given it the most radical overhaul in its history. Well, it's certainly been a busy few months at Breitling since the brand's new owners CVC Capital Partners named Georges Kern as CEO. Credited with overseeing a decade of achievement at IWC, before being elevated to watch division chief at parent company Richemont, from whence he was quickly sprung to his new rôle at Breitling in a move which was received with some measure of surprise, considering he'd only been at his desk for a matter of weeks. With the unveiling of this bold new Navitimer family, it's clear that Kern is already implementing a root and branch rebuild of a brand whose fortunes in recent years have largely failed to live up to expectations; its designs uninspiring and stagnated in a precarious comfort zone which traded on past glories. And if you think that's a bit harsh, it was obviously an issue Kern had prioritised, and one he's been fast to address. 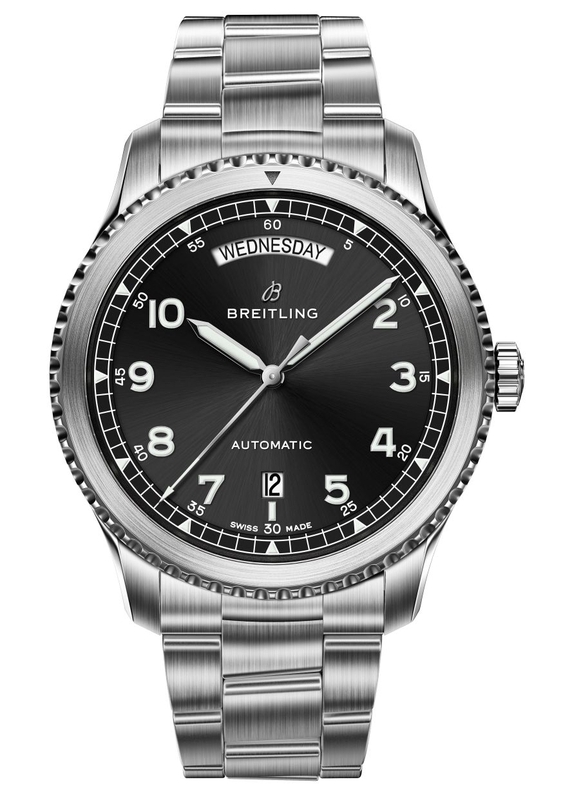 From its famous winged masthead logo on down, the changes have been ruthlessly applied, and they certainly won't please everyone, but Breitling has a new look, and it's really rather good. In a shock revelation, albeit one with a point, I've always looked on the Navitimer with a passing interest yes, but never really more than that. Of course I respect and appreciate what it is, and how since its debut in 1952, with its big dial and its information filled array of readings and functions it would become an almost ubiquitous professional aviator's timing instrument and an icon of that industry. Still, it was always just too much for my own taste, a bit too shouty for one who's quite happy to be flown than to fly, and once it was adopted as a symbol of the bling culture, a watch which was moving even further off my own personal radar. It would take something seismic to change a feeling like that but incredibly, and back to my point here, where the Navitimer emphatically did not appeal to me before, I’m certainly more interested now. In fact I like it a lot. So could that mean there may be others like me? A new and unexpecting demographic for George Kern’s Breitling? You can bet on it. 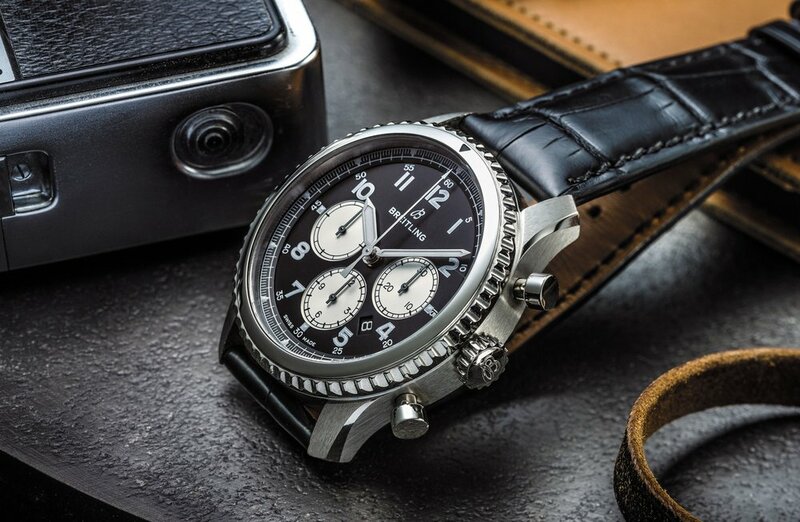 Witness the Breitling Navitimer 8. For this new era in the company’s history, some tough decisions have clearly been made at the drawing board stage. Essentially unchanged in its layout for its more than sixty-five year history, it would take a brave call to systematically bleach out much of the Navitimer’s signature characteristics, and return it into the spotlight virtually unrecognisable, with an entirely new design, a new face, a comprehensive range of models which broaden its appeal, and even including, for the first time, non chronograph options. While the new collection has been designed without much pause for sentimentality, still nuances of the Navitimer of old remain if you look hard enough. The new bezel is much thicker but the spacing of the notches around its edge is familiar, as are the crown and chrono pushers. On the dial, the lume filled arabic numerals, and principal hands are pretty much the same too, but that italicised swooping 'B' motif which balanced the tail end of the seconds hand for so long has now been deemed surplus to requirements. Even that one sacred thing you tamper with at your greatest peril: a universally recognisable and distinctive logo, has had its wings clipped off entirely. So in short, if you were a lover of the old model, then there are only very subtle cues to remind you of that enduring heritage. This is a transformation of Biver-esque proportions, and that's certainly not a bad thing when it's done so well. The Navitimer 8 (it's name taken from the company's dashboard mounted aviation instruments, which were fitted with mechanical movements with eight day power reserve) is a fresh and stylish range of contemporary wristwatches which are more sporty in their appearance, although functionality wise, still very much designed with its core base of aviators in mind. So far there are six new Navitimer 8 models, and they'll be available in stainless steel, with the option of black DLC finish, black, blue or silver dials and with strap or bracelet, each one has its own distinct slot in the family photo lineup. Whereas the Navitimer we knew was like a pilot's horological equivalent to the Swiss Army Knife, it now offers a much more simplified configuration, with clean layout and clear functions, and with a model to suit most requirements, even if that's only for telling the time in its most basic form. Packaged in 41mm stainless steel cases, the Navitimer 8 Automatic, and the Day and Date models are the first to be seen without the chronograph, and at a stroke the collection is both better fleshed out with these new options, appealing to a new and broader audience, and therefore a more accessible entry point to this quite legendary name. As a pilot's watch, legibility is still a key factor, and so the numerals, markings and hands with Super-LumiNova coating are clear and distinct, even in low light conditions, and this is true across the new collection. The Unitime is another single crown piece, although this time that crown is used to wind and set the time, as well as adjust the 24-hour hand back and forth in one-hour jumping increments against a ring of city names, so local time or home time are easily referenced. It also features a rotating bezel too, so the arrow tip indicator can be aligned with a third time zone as well. Encased in a 43mm case, it brings the styling of the brand's 1950s Unitime world timer into the fold of the Navitimer collection, where one would imagine it should now become a permanent fixture, and a real contender for consideration in the increasingly popular travel time sector. It still packs a lot of information, but the dial is really well laid out, with space for everything, and so not too busy for use as an everyday watch. Of course there simply has to be a chronograph in any Navitimer collection, and in fact there will be two, but it's here that the effects of the new direction are most profoundly felt. To the uninitiated, with its rows of numbers which dominate the face, it's always seemed like one would require a degree in physics to make use of the Navitimer's various markings (although in reality, it was relatively straightforward to use). This is no longer the case, and instead of cramming the dial with so much information the display has been completely revamped, getting rid of the complex and instilling a much less cluttered aesthetic. There will surely be howls of derision from some quarters, but for me this Navitimer Chronograph is a completely new proposition. Both models will come in at 43mm. One, the Navitimer 8 Valjoux Chronograph will be powered by the ever reliable ETA (nee Valjoux) 7750 automatic movement with its signature layout of day and date at the three o'clock position, small constant seconds at the nine, and with twelve-hour and thirty-minute chrono counters at the six and twelve respectively. 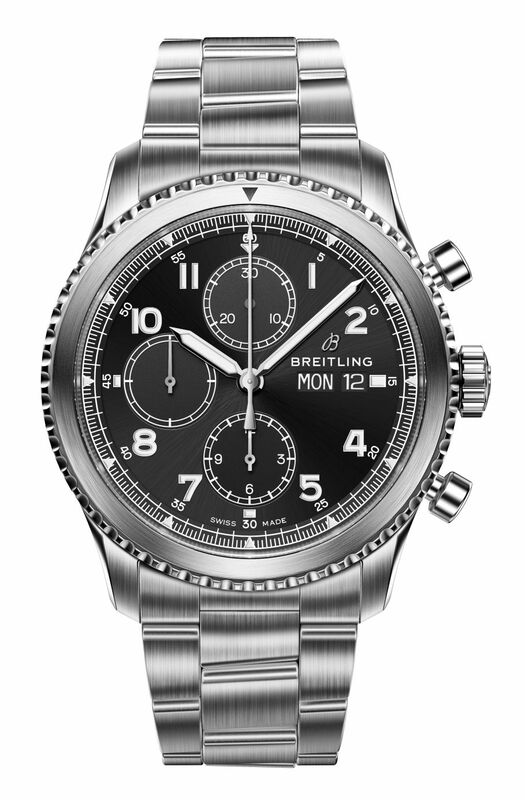 The second chronograph, the Navitimer 8 B-01, is equipped with Breitling's own, in-house self winding Calibre B-01, and while, with the exception of the day display, it performs much the same function as the Valjoux, it does have that pedigree of manufacture status, and so the detailing on the dial, such as the recessed subdials with binary 'panda' colour contrast are that little bit more distinguished. All six models (there is one B-01 in 18kt gold) are calibrated to C.O.S.C. official chronometer rating, and transparent sapphire casebacks reveal the mechanicals within, and with the exception of the Valjoux Chronograph, all now feature Breitling's in house movements. There's no getting away from it; as a business model these drastic changes make a lot of sense. Yes, it might seem like an act of heresy to set aside design signatures which have for so long defined a famous collection, but if that collection is tired and going around in circles, if sales are behind target, and it's becoming something of a weight to carry around, then change is needed to move it forward once more, to push it back onto our radar again, and to seek out a new generation of paying customers (which is the only metric that really matters in the end). Georges Kern's first play as CEO of Breitling is unquestionably a daring one, but it's not without precedent either; under his stewardship IWC has become a much more cohesive offering, making fuller use of its wide range of models, re-establishing a clear place in the market once again as the masculine, technical brand its controversial advertisements used to portray, whilst simultaneously expanding its more reserved side. Then there's always the example of one Jean-Claude Biver as a determined and ruthless implementer of change too. Not always popular with the traditionalist, but usually right on the money, and last time I looked, Zenith, TAG Heuer and his own beloved Hublot, a once tired and flagging brand, into which he injected a whole new revitalising philosophy, aren't doing too badly these days.